YANGON — A pre-dawn blast at a warehouse in Myanmar's biggest city killed at least 17 people and injured dozens more on Thursday, sparking a blaze that took firefighters hours to tame, officials said. Officials ruled out a bomb but said they had yet to determine the cause of the explosion in Yangon, formerly the capital. Residents in several areas of the city were woken around 2:00 am (1930 GMT) by the blast, which appeared to have hit a medical warehouse in the eastern township of Mingalar Taung Nyunt, witnesses told AFP. The flames engulfed several buildings in the warehouse compound and destroyed around 50 homes in the area, most of them wooden dwellings. At least 17 people, including four firefighters, had died, while 79 others were injured, including around 30 firemen, a government official told AFP. "It was not a bomb explosion," another official said, though he added that the cause of the blast, which sparked a large fire that destroyed many nearby storage units and houses, remained unknown. Firefighters battled through the night to douse the flames and finally succeeded in extinguishing the massive fire at around 6:45 am, revealing a scene of utter devastation. An AFP photographer saw rescue workers frantically searching for survivors, carrying young children to safety and pulling a dead body from the burnt-out rubble. The blaze left hundreds homeless, a third official said. "Around 900 people are homeless now and they are sheltering at nearby monasteries serving as rescue centers," he said. "About seven warehouses were totally destroyed. The responsible officials are still trying to find out what happened," he told AFP. One resident, Khin Hla Kyi, said she feared for her life as she fled the encroaching fire, which devoured her home and all of her possessions. "We had to run for our lives," she told AFP. "Now we have nowhere to go. My house was destroyed." The blast also created a huge crater at least 10 metres (yards) wide and several metres deep, filled with plastic and metal debris. Dozens of rescue workers and onlookers crowded around the gaping hole to take stock of the damage on Thursday, when white smoke could still be seen billowing from the site. An exhausted firefighter said he was unable to give details about the blaze, saying only: "We are really tired because we have been putting out the fire all night." The first funerals for the victims were due to be held Thursday afternoon. In a city not unused to bomb blasts, the sound of the unexplained explosion overnight brought hundreds of worried locals into the streets. "We heard a very loud noise from the explosion and saw smoke in the sky. Our building was also shaken by the explosion. We have no idea what's happening," a resident in nearby Botahtaung township told AFP. Last week, a blast caused by an explosive device killed one woman and wounded another in northern Yangon. Myanmar has been hit by several bomb blasts in recent years, most of them minor, which the authorities have blamed on armed exile groups or ethnic minority fighters. (CNN) -- A Syrian doctor who became one of the country's most wanted men has been killed trying to flee to Turkey, opposition sources said. Dr. Ibrahim Othman, 26, was a founder of the Damascus Doctors, a network of doctors that secretly treats wounded protesters who are afraid to go to government-run hospitals. A video purporting to show him dead, and including shots of what appear to be his passport, was posted on YouTube on Saturday. CNN cannot independently confirm the authenticity of the video. Friends and colleagues described him on a Facebook memorial page as "strong and fearless, with a pure heart." Well known for his love of pranks, Othman said he was born to help people -- a desire that may have ultimately cost him his life. In July, he showed CNN a secret treatment center where he works, a tiny room with basic equipment and supplies. "It's illegal, but this is the only way to treat injured demonstrators," he said. He knew he was putting his life on the line. "Yeah, I know that, but the demonstrators, they are risking their life too, so we have to help them," he said. There was little the Damascus Doctors could do for many of the wounded, he conceded. "We spend all of our life to help people, and it's so hurtful to see people dying. And we cannot do anything," he said. Some wounded protesters could be saved if they went to hospitals, Othman said. But there were risks involved. "They refuse to go the government hospitals because they will be arrested," he said. The director general of Damascus Hospital rejected that claim. "We accept all cases without regard as to how the injuries were sustained or where It happened," Dr. Adib Mahmoud said. But many do not believe it. "They would detain me if I went to the hospital," said a teenaged patient of Othman's who said his back was cut when Syrian security forces dragged him over broken glass. In the end, Syrian security caught up with Othman too, his friends and colleagues said -- as he feared they would. "Every time when I leave home, I say goodbye to my mother," he told CNN when asked in July about the hardest part of his life. "Sometimes I feel I won't be able to come back and see her again." NATO blunder in the northwest, Islamabad closes the "Khyber Pass"
AFP - Pakistan said Saturday it would review all its agreements with Washington and NATO, especially in the diplomatic, military and intelligence, following the worst blunder of Westerners in Pakistan in a decade, which killed 26 soldiers. Following an extraordinary meeting of its main leaders, the Pakistani government has also ordered the Americans to withdraw within 15 days of the Shamsi air base, located in south-western Pakistan, and closed all supply routes for NATO in Afghanistan from its territory. The ministers and heads the largest of the army attended Saturday's meeting of the Committee for the Defence of the Government (DCC) under the chairmanship of Prime Minister Yousuf Raza Gilani, said the latter's office. "The DCC decided to close with immediate effect logistic supply routes to NATO / ISAF (the NATO force in Afghanistan)," the source said. The vast majority of these supplies arrive by boat to Pakistan in Karachi (south), the country's main port, before being sent to Afghanistan by road. "The DCC has also decided to ask the U.S. to leave within fifteen days of the Shamsi air base" that would be used by the CIA as part of its drone strikes in Pakistani tribal areas bordering Afghanistan. Moreover, "the DCC decided that the government would completely rethink all its programs, activities and cooperation agreements with the United States, NATO and ISAF, including diplomatic, political, military and intelligence" announced Gilani's office. Pakistan has accused NATO of killing up to 26 Pakistani soldiers in an attack before dawn Saturday in one of the tribal areas, the main rear base for Taliban insurgents and Al Qaeda who regularly attack NATO on Afghan soil. According to Islamabad, NATO helicopters bombed a Pakistani military post Baize, in the tribal district of Khyber. "They killed 26 soldiers and wounded 14," he told AFP Masood Kausar, the governor of KPK, Northwest Province of Pakistan, before paying tribute to the "martyrs". In the evening, a spokesman for ISAF, General German Carsten Jacobson, said Afghan forces and NATO operating in the Afghan province of Kunar called for air support had and it was " very likely that the air support (...) has caused losses "in Pakistan. The officer assured that ground troops were now near the Pakistani border. Denouncing "a serious breach Pakistan's sovereignty and a violation of international law", Prime Minister Yousuf Raza Gilani has protested "in the strongest terms" with NATO and the United States, who lead the ISAF , providing the two-thirds of his troops. Gilani interrupted his weekend to return to Islamabad and talks with President Asif Ali Zardari and the leaders of the powerful army which has denounced an attack "deliberate" and "unacceptable." The Information Minister Firdous Ashiq Awan for his part believed that the attack would strengthen the anti-American sentiment among his compatriots. The U.S. ambassador in Islamabad Cameron Munter, meanwhile, said his country would work "closely with Islamabad to investigate this incident." Pakistan has repeatedly criticized in recent years for violations of its airspace by ISAF. The latest crisis began in September 2010. Islamabad had then accused the force of killing three Pakistani soldiers and blocked the supply trucks of NATO for almost two weeks, until Washington apologizes. The United States regularly bombed the Taliban and Al Qaeda in the tribal areas with drone raids Islamabad denounces as lip service, as long as they do not kill many civilians. Americans regularly accuse their ally Pakistan playing a double game and secretly supporting the Taliban to defend its strategic interests in Afghanistan, where NATO plans to withdraw all its combat troops by the end of 2014 . Already stormy relations between the two countries soured after the unilateral U.S. operation in which killed the head of al-Qaeda Osama bin Laden last May in Abbottabad, a garrison town in Northern Pakistan. AFP - Japanese Minister of the Environment announced Friday that he renounced his monthly salary of 15,000 euros after some employees of his ministry were thrown on a vacant contaminated soil sent by a resident of Fukushima for that it is tested. 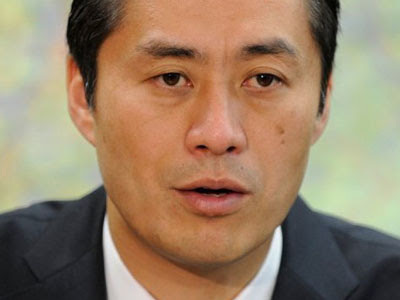 Goshi Hosono, a rising star of the Democratic Party of Japan (in power), said it would affect more than his salary for the duration of its mandate to assume the fault of his subordinates. The minister, who is also responsible for the management of the accident at the nuclear Fukushima, however, will continue to receive his parliamentary allowances, which amount to about 13,000 euros a month. "I have a heavy responsibility as head of that department," he said, following the announcement of stupidity committed by an official. A resident of the city of Fukushima, located about sixty miles from the Fukushima Daiichi Nuclear Power Plant accident, sent last week to the Department of Environment package containing soil taken from his garden so that it is analyzed . The samples taken showed a rate of 0.18 mSv of radiation per hour, roughly the same as that tested in the vicinity of Tokyo. After that discussion to the package, an employee offered to unload the contents of a vacant lot near his home in Saitama prefecture, northeast of the capital. The land has since been recovered and the employees involved and their superiors, have received disciplinary sanctions, including temporary salary reductions, transfers and warnings, said Hosono. (Reuters) - President Barack Obama announced on Thursday that the U.S. military would expand its role in the Asia-Pacific region, despite budget cuts, declaring America was "here to stay" as a Pacific power which would help shape the region's future. China has voiced misgivings about Obama's announcement of fresh troop deployments to Australia and has longstanding fears that its growing power could be hobbled by U.S. influence. But Beijing has also stressed that conflict is in nobody's interest. Obama addressed the Chinese unease, pledging to seek greater cooperation with Beijing. The U.S. military, turning its focus away from Iraq and Afghanistan, would be more broadly distributed in Asia, particularly Southeast Asia, more flexible and help build regional capacity, Obama told the Australian parliament. "As we end today's wars, I have directed my national security team to make our presence and missions in the Asia Pacific a top priority," Obama said in a major speech on Washington's vision for the Asia-Pacific region. "As a result, reductions in U.S. defense spending will not -I repeat, will not - come at the expense of the Asia Pacific." Obama was clear in acknowledging China's discomfort at what it sees as attempts by Washington to encircle it. "We'll seek more opportunities for cooperation with Beijing, including greater communication between our militaries to promote understanding and avoid miscalculation," he said. Nervous about China's growing clout, U.S. allies such as Japan and South Korea have sought assurances from the United States that it would be a strong counterweight in the region. A first step in extending the U.S. military reach into Southeast Asia will see U.S. marines, naval ships and aircraft deployed to northern Australia from 2012. China has questioned the new U.S. deployment, raising doubts whether strengthening such alliances helped the region pull together at a time of economic gloom. Obama said the United States would seek to work with China to ensure economic prosperity and security in the region, but would speak candidly about issues such as human rights in China and raise security issue like the South China Sea. China claims the South China Sea, a vital shipping route rich in oil, minerals and fishery resources. But Vietnam, the Philippines, Taiwan, Malaysia and Brunei hold rivals claims to at least parts of the sea, sparking maritime stand-offs. U.S. Secretary of State Hillary Clinton pointedly visited the Philippines on Wednesday, saying that no claimant should resort to intimidation to push its cause. Obama also referred in his address to reforms undertaken by Myanmar's new civilian leaders, including the release of political prisoners. But he said they had to do more on human rights in order to secure better relations with Washington. Rory Medcalf, security analyst at the Lowy Institute for International Policy in Sydney, said Obama's speech marked a hardening of policy toward China, though he noted that the president was still reaching out to Beijing. "I think we are seeing a firm stance from Obama. He spent the first year of his presidency trying very hard to engage with China, perhaps even to accommodate China," said Medcalf. "I think he feels that he was rebuffed and that he was in effect taken advantage by China. So, there is a fundamental reorienting of American policy on display here." The winding down of wars in Afghanistan and Iraq has opened the door to greater U.S. attention to simmering tension over the South China Sea, a shipping lane for more than $5 trillion in annual trade that the United States wants to keep open. Obama and Australian Prime Minister Julia Gillard on Wednesday agreed to have 2,500 U.S. Marines operate out of a de facto base in the northern port of Darwin by 2016. The United States has military bases and large forces in Japan and South Korea, but its presence in Southeast Asia was dramatically reduced in the early 1990s with the closure of bases at Clark Field and Subic Bay in the Philippines. Deploying U.S. Marines, ships and aircraft in Darwin, only 820 km (500 miles) from Indonesia, will allow the United States to quickly reach into Southeast Asia and the Indian Ocean to ensure secure major trade sea-lanes. Obama cited increased U.S. naval ship visits and training in the Philippines and Singapore, working with Indonesia to fight piracy, partnering Thailand for disaster relief, and significantly, acknowledged India's role in region security. Washington welcomed "India as it 'looks east' and plays a larger role as an Asian power. "We'll have new opportunities to train with other allies and partners, from the Pacific to the Indian Ocean," he said. 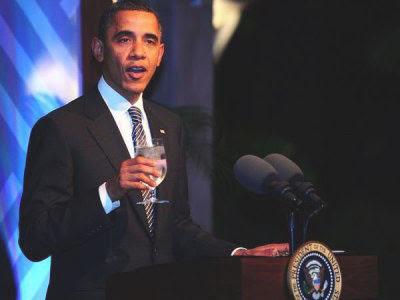 Medcalf said: "It will be a landmark speech of Obama's presidency. It states unequivocally that the U.S. is squarely focusing its strategic attention on Asia. Its defining that Asia as including the Indian Ocean and India." In a note to his domestic audience, Obama said the increased focus on Asia-Pacific was essential for America's economic future. "As the world's fastest-growing region-and home to more than half the global economy-the Asia Pacific is critical to achieving my highest priority: creating jobs and opportunity for the American people," he said. Obama will fly to Bali late on Thursday, where he will seek to underscore a focus on Asia by becoming the first U.S. president to participate in the security East Asia Summit. AFP - U.S. President Barack Obama officially opened Sunday the summit of the Forum on Asia-Pacific Economic (APEC) in Hawaii, dominated by a proposed free trade area comprising half of the 21 member countries. "We now have the opportunity to move toward our ultimate goal: a regional economy without hindrance," said Obama, who announced Saturday an agreement on the outline of a proposed free trade agreement between 10 countries Asia-Pacific. Popular musicians, singers and cultural Bhupen Hazharika have died after prolonged illness. He was 86. Dada Saheb Falke Award winner Hazharika was being treated at a hospital in Mumbai. Jayanta Narayan Saha media in charge of the hospital said, "at evening many parts of the body stopped working,after four and a half hours she was dead." Hazharika had trouble breathing, the both kidney was damaged and was placed on dialysis. 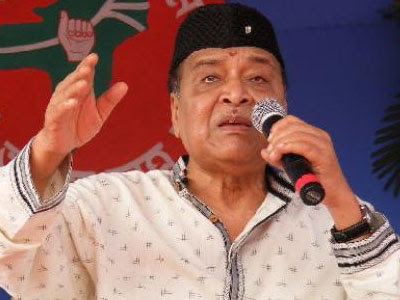 Hazarika was best known for his folk songs and ballads, sung in a number of Indian languages, but he also sang and wrote music for hundreds of films. He was known as the Bard of Brahmaputra after the river flowing through his native Assam state in eastern India. "As a child, I grew up listening to tribal music - its rhythm saw me developing an inclination towards singing," he said in an interview. "Perhaps, I inherited my singing skills from my mother, who sang lullabies to me." he said. He was awarded the Dadasaheb Phalke Award, Indian cinema's highest honour, for his contribution to film music. He had a PhD in communication from Columbia University in New York. China has, on the night of Wednesday 2 to Thursday, November 3, a further step to become a major space power by passing the docking of two unmanned vessels, crucial step towards building a space station planned by 2020. At 17 h 36 GMT Wednesday, the Shenzhou-8 has joined to the module Tiangong-1 at a speed of about 28 000 km / h to 343 km above the Earth, said Thursday the spokesman Chinese manned space flight program, "Wu Ping." Shenzhou-8, whose name means "divine vessel" had taken off Tuesday from the base of Jiuquan, which was also a party on September 29 module test Tiangong-1 ("heavenly palace"). Chinese leaders including Premier Wen Jiabao attended at night to the retransmission of the operation, described as a "kiss" space in the media from the control center in Beijing. President Hu Jintao, who is in France to attend the G20 summit in Cannes, has sent a congratulatory message. ORBITAL STATION CHINA Shenzhou-8 and Tiangong-1 will remain docked for about twelve days before separating, to unite again for two days. Seconds after their separation, "Shenzhou-8 must return to Earth on November 17 in the afternoon," said Wu Ping during a press conference. The first tie is part of the program for providing, by a decade, China a space station in which a crew can live independently for several months, as the old Russian space station Mir and the ISS (ISS). 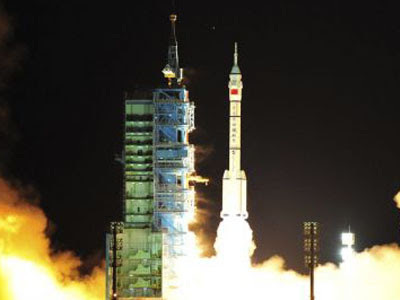 If the Shenzhou-8 is successful, China will launch next year two other ships to join Tiangong-1, Shenzhou-9 and successively Shenzhou-10, which at least will be inhabited.